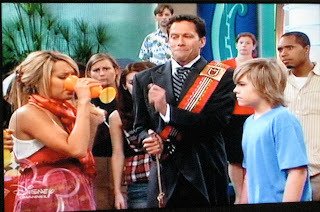 Our friend Scott is appearing in a new episode of Disney Channel's Suite Life on Deck tonight at 8:00 p.m. The boys love The Suite Life of Zach and Cody, which is a show about two twin boys who live in a hotel suite with their mom, the lounge singer. They make everyone at the hotel crazy, and love the candy counter girl Maddie, played by High School Musical's Ashley Tisdale. The Suite Life on Deck is a spin off where the boys are now living on a cruise ship. Tonight's episode is the one time this season Ashley Tisdale will make an appearance, and true to the typical story line, a young prince falls in love with her. Scott plays the prince's herald. Our boys are excited and think we are so cool. Never mind the many other connections we have in the entertainment world, right now it's all about the Disney Channel!